We’re all taught to share our stuff, yes? Surely this doesn’t apply to chocolate? Chocolate has a special exemption. Here’s a photo of the back of a large-size (not what I’d call “large size”, in what crazy mixed-up universe is 100g of chocolate “large-size”?) Milky Bar I bought a couple of weeks ago. I bunged on an episode of Grey’s Anatomy and five minutes later the Milky Bar was in my tummy. All of it. Indeed. No way I was going to share that teensy little bar! White chocolate without “cookie” pieces? Yeah, I wouldn’t share either. Ha! I wonder if World Market has it…might only cost me two or three dollars LOL. I love Flake, I just have to be careful it doesn’t go everywhere. No sharing of the Flake! You can certainly have my Jelly Belly’s, and I’ll take the chocolates. At the risk of sounding OLD, I remember when candy bars were really big enough to share! I bought a pack of Mars Bars at the same time (it was for the weekend I had to work and I wanted some sugar on hand) and I actually thought they were snack size until I got them home and read the packet – “full size”. I blame vending machines – it’s easier to make stuff smaller than program a billion machines for a price increase. Plus I blame money-grabbing corporations too, of course. Had a nice but unusual easter egg this year – Guinness flavour chocolate! A proper man’s chocolate… and definitely NOT for sharing!! 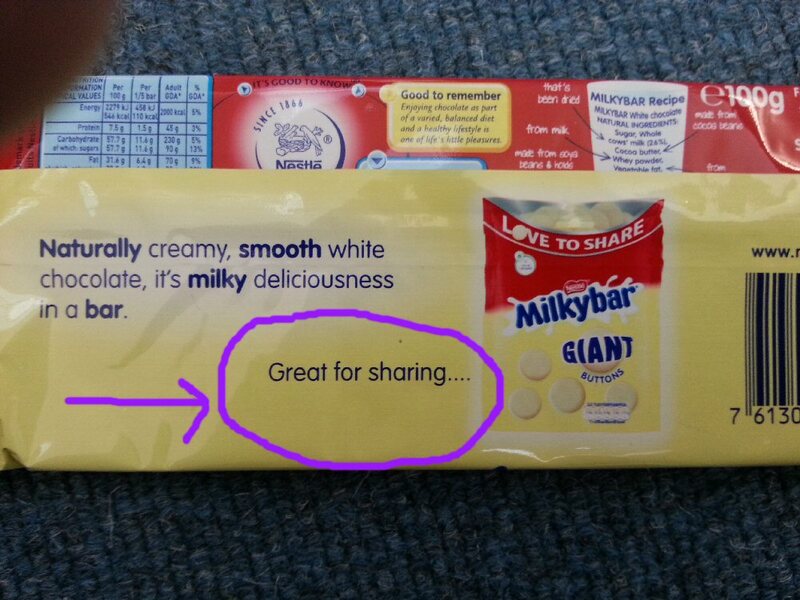 Hahaha – that is in fact a typo, because there’s no way that could be considered a share-size bar. Nope! I don’t even know what I would actually consider a large size when it comes to chocolate. It always ends up feeling like it’s never large enough! I’m glad we share this love for chocolate, my friend! I love dark chocolate, darker the better. Chocolate has no calories, I’ve known that for years. Yes Milky Way bars seem similar to what you ate. They can be ordered online. I recently ordered dark chocolate M&M’s, they are special made once a year and very few bags remained. I always suspected that chocolate is a food group. I like dark, white and milk chocolate. It depends on my mood really, but I have heard that dark chocolate is actually quite good for you (in moderation of course). We have Milky Way here but they’re quite different – they’re milk chocolate with a sort of soft light inside. Milky Bars are solid white chocolate. I wonder how many double acts do end up entertain fantasies like this. Great story. I would imagine many have these thoughts from time to time!